ClearSpan announced their biggest savings in history. The limited offer encompasses the entire line of ClearSpan's building solutions. ClearSpan Fabric Structures eagerly announced the biggest sale in the company’s history, which will encompass the entire line of ClearSpan’s building solutions. The sale provides customers with unparalleled savings, and allows them to save up to 10 percent off their greenhouse structure price, while also taking advantage of free shipping. This is a limited time offer, so act now. There are no exclusions with this sale, no matter the size or style of building, so customers can potentially save tens of thousands of dollars. For nearly 40 years ClearSpan has been supplying versatile building and storage solutions across many industries, including agriculture, construction, waste, municipal and much more. With custom designs and turnkey options, customers are able to get their ideal building solution when they need it most. ClearSpan provides the premier fabric structure that allows ample sunlight to filter though, creating an interior that is well lit, but soft on the eyes. The natural lighting allows users to completely cut out artificial lighting, providing savings on a daily basis. This combined with superior natural ventilation and climate-sensitive covers that keep the buildings’ interior cooler in the summer and warmer in the winter, enables the customers and their business to realize maximum profitability. The covers are supported by a triple galvanized steel frame that provides the highest level of structural integrity and can withstand any environment, no matter how harsh. ClearSpan stands behind these durable building solutions and provides industry-leading warranties, which include a 50 year warranty on the steel frame and a 20 year warranty on the fabric cover. ClearSpan staffs industry specialists, so however customers plan to use structure, ClearSpan Specialists can offer invaluable design and building advice. ClearSpan offers a one-stop shopping experience, so no matter the specifications, required accessories or tools, ClearSpan can make it happen. 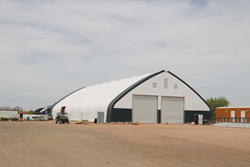 With in-house financing and installation services, getting a building – no matter what size it is – has never been easier. To take advantage of this sale, call 866.643.1010 or Request a Quote at http://www.clearspan.com today.